Owner Maria Teresa Etrusco, a Sao Paulo native who has lived in France, opened her doors on May 1, 2008, after two years of planning and design. Casa Turquesa innovates by being a boutique pousada; it is a cut above the rest, unique to Paraty. Designed by Renato Tavolaro, while keeping with the historical tradition of the town, Casa Turquesa has been converted to a contemporary nine-room guest house with beautiful design touches, terrific attention to detail, and immaculate workmanship. Upon check-in guests are given personal sandals, as part of the transformation experience, to be worn around the hotel. Each suite has a unique color theme, noted by the tassel on the door and the accents of the room. All suites have high ceilings, large beds, quality furnishings, and large state-of-the-art bathrooms. Every detail has been very well thought out; Casa Turquesa features amenities that owner Maria feels are omitted in other hotels, such as full-length mirrors, good reading lights on adjustable stands, and Egyptian cotton bed linens. Additionally, the staff at Casa Turquesa make you feel like family; if you wake up at 2:00 PM and want breakfast, it's there. All meals are cooked on premises using the freshest local ingredients. The communal reading space, equipped with a fireplace for cool evenings, echos a feel of home. A luxurious plunge pool is the centerpiece in a walled garden adorned by native plants that display Brazil’s natural beauty. At check-out each guest is given a personal parting gift as a remembrance of their stay. A great deal of attention was paid to the environment in the design of Casa Turquesa. The layout of the property capitalizes on provided sunlight and cross-ventilation. Additionally, the pousada was constructed using local woods, keeping in tradition with Paraty's colonial history. As far as energy usage, Casa Turquesa utilizes energy efficient lights and fans, uses one towel per person, and individual A/C units and water heaters. The pousada also installed an eco-friendly waste management system. In the kitchen, products for breakfast and tea are grown locally. In the office, all employees are locals. In fact, the art throughout the hotel is that of a local employee, Francisco. The owner is a caretaker of the local animals. A stay at Casa Turquesa truly proves that environmental sustainability does not require a compromise in luxury or comfort. 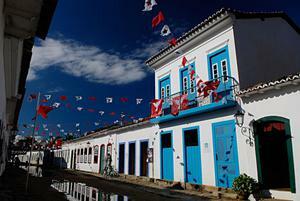 Casa Turquesa was elected ‘Pousada of 2008’ by Guia Quatro Rodas, Brazil’s most respected hotel guide.